This method allows the company to participate (and to inspect/control) to the process of production without possessing or having to manage the farms, the work force or organizing the production. It allows the farmers to stabilize their yields; to keep the ownership of there land; to reduce the relative risks of production ; to obtain supplies, a technical support and an access to the market ; to improve production. – Production risk (new crops). – High transaction costs cf. large number of dispersed farmers. 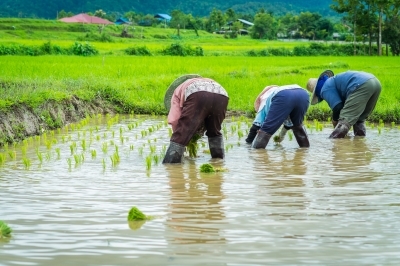 In Laos, contract farming is governed by the Law on contracts from 1990. It elaborates on the general specification to follow (duration, ending date, quality, price); obligation of results and mutual information; penalties for failure to abide by the terms of the contract; arbitration in case of conflict; conditions for changes in the contract, termination of the contract. Contract farming implies an investor and a farmer, villages or organisations of producers. It can also imply a intermediary (chief of village, other producer, harvester, etc.) in charge of negotiating the contract, of transmitting information or of the collect of the production. Different combinations of resources can be offered to the farmers: provision of inputs (seeds, agrochemicals), credit, extension. Local authorities play an important role (facilitation, contract management, technical support), esp. in isolated areas where farmers have little experience. 1+4: the farmer brings land and works for a salary (wage worker on his own land). Investor pays for all activities before the sharing of the rubber (7-8 years). The land or the trees are then shared with the farmers. Farmer must sell his rubber to the investor at market prices.